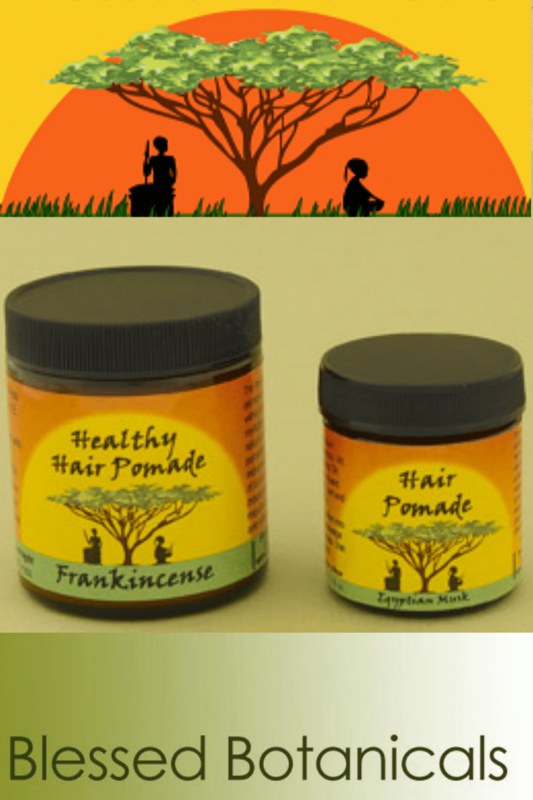 The Healthy Hair Pomade is helpful for dandruff, protects hair from damaging sun rays and excessive heat, repairs and prevents breakage and split ends, and will add and maintain moisture to dry and brittle hair. Unlike petroleum-based hair care products, the Healthy Hair Pomade will not clog pores or block hair shafts, therefore stimulating growth. Available in: Frankincense, Jasmine, Tunisian Amber. Blessed Botanicals is a Eugene, Oregon-based family business specializing in high quality herbal body and hair care products. We do not use any artificial ingredients or preservatives. We make small batches of all of our products to ensure maximum potency and effectiveness. All of the herbs that we use are either selectively and ethically wildcrafted or grown organically. Every other ingredient used is certified organic whenever it is affordable and available. We solar infuse our botanical oils for six weeks; to humbly access the power of the sun and to not use unnecessary electrical energy. Blessed Botanicals does not test our products on animals and we are proud members of The Coalition for Consumer Information on Cosmetics (CCIC) and the Leaping Bunny Program. For more information on these programs go to www.leapingbunny.org.